This is why house prices have been rising whilst real terms average wages have been falling because the wealth the economy generates is further being concentrated into the hands of the elite who re-invest it into capital assets such as property pushing up prices which further reduces available supply for the wage slaves hence why most people including academic economists just cannot understand how house prices can be rising when average earnings have been falling. THE WEALTH GENERATED BY THE ECONOMY (wage slaves) IS BEING RE-INVESTED BY THE ELITE INTO CAPITAL ASSETS SUCH AS HOUSING and Stocks, and this is a reinforcing cycle that ultimately ends when the elite (0.1%) own virtually ALL of the assets (over 90%) resulting in a society that is PRIMED for a REVOLUTION! The only way for individuals to break out of the debt system is as I have voiced countless times in many articles and several ebook's (FREE DOWNLOAD) is to NOT borrow money and to accumulate income generating assets the most familiar of which to most would be rental properties and lesser stocks given that I deem stocks to be a higher risk asset class than properties. The stocks bull market raged on for another year to close at Dow 17,823 (+7.5%) following the Dow's most recent all time high set just a few days earlier at 18,103. This despite widespread calls of bear markets and even crashes that coalesced around a series of bad news events such as surrounding the US debt ceiling triggering a government shutdown and not forgetting Octobers end of QE apocalypse, with such doom calls always reaching their most vocal just at the end of every correction. In the real world my automatic response to people asking me about what’s happening to the stock market is to say "It's October, this is what always happens in October before we get the Santa rally ". Of course a real life crucifixion would mean the fools would would ceased and desisted in their demented ramblings, but that is one of the negatives of the passing of the Pagan Roman Empire. Instead the so called market commentators march on as if nothing happened despite spouting more garbage because clearly they NEVER put their own money on the line, which is the real secret for arriving at the most probable outcome. This is why virtually every time I write an article on the stocks bull market I get so many comments and reasons to explain why I this time I am wrong and it has ended. My last in-depth analysis of the year concluded in the following trend forecast into the End of January 2015. My long standing view remains that the stock market rally will continue into the end of the year when I expected the Dow to be trading north of 18,000. Greeks recently voted for Syriza as the largest party on 36.3% that put the radical left party within a couple of seats of securing a majority of 151 in Greece's 300 seat parliament which includes automatically getting allotted an extra 50 seats. Syriza soon achieved an overall majority by going into coalition with a small right wing UKIPesk party of 13 MP's. The people of Greece having had enough of near 5 years of economic austerity that had yet to fully succeed in correcting the preceding decade long partying spending and corrupt kickbacks binge at the euro-zones expense. Now the people of Greece have effectively done a deal with the devil that promises to return Greece to the good old party days of rampant debt printing (fake government debt statistics) and corrupt governance all without the consequences of accelerating double digit inflation as a consequence of being within the euro-zone. Greece will effectively run out of money by the end of February, by which time if Syriza has made good on threats of starting to default on debt then the euro-zone will likely withhold payment of the next tranche of bailout monies due by then of approx Euro 8 billion that could embolden Greece to threaten a default on total debt of Euro 250 billion most of which it owes to other euro-zone members (Euro 200 billion). Understanding fully that a total default would mean an near immediate exit from the eurozone that could trigger other highly indebted in permanent economic depression members such as Spain and Portugal to possibly also declare their intentions for an more orderly default / exit from the eurozone. Additionally, Germany after 5 years of funding the Greek black hole has finally indicated that Germany would now be prepared to see Greece leave the euro-zone, so signaling that euro-zone would no longer bend over backwards to keep Greece within the Euro-zone as no matter what the Greeks state regarding the guilt of others, namely Germany piling debt on top of debt. The fact is that greece should NOT be in the Euro-zone. The Greeks cannot have it both ways, they either stay and service the debt / slowly inflate it away or leave and print their own currency i.e. hyper-inflate. However, in the wake of the Syriza election victory, there has been an accelerating run on Greece's bankrupt banks which means rather than Greece having a few weeks, the situation may spiral out of control in a matter of days! The unfolding Greek crisis will probably trigger a series of Euro-zone summits during the year where the terms for exit from the Euro-zone will be agreed upon. What is unknown at this time is whether Greece will also have to leave the European Union as the Lisbon Treaty implies. My opinion is that Greece will be allowed to remain in the European Union to salvage something from the unfolding chaos. In conjunction with the summits formulating the mechanisms for Greece and potentially others to leave the euro-zone there will be real world consequences for Greece in terms of the currency in circulation as a new currency would need to be printed and distributed (we may in the interim see vouchers or even photocopier paper currency used to pay public sector wages) causing chaos across Greece in terms of the standing of contracts such as Mortgages made in Euro's but no longer honoured in Euro's triggering a collapse of its banking system (already well underway) as no one will want to hold its new currency. This would result in a continuation of the slide of the Euro and a collapse in the value of the new currency (when eventually printed) potentially in the form of an hyperinflation panic event, i.e. we will see the Greek inflation rate soar as a consequence of Greece no longer being able to buy any goods or services from abroad due to the capital markets being closed to Greece. I had previously estimated that Greece could experience an annualised inflation rate of at least 30%, which given the nature of the new government that would do nothing to address the requirements of capital markets could probably soar far higher amidst a panic driven spike as any money left in Greece flooded out of the country before capital controls came into force. All of the weak euro-zone countries are waking up to the fact that they have been in a state of denial because they are NOT Germany they cannot compete against Germany that effectively holds a captured market for its goods and services that they purchase with German loans, and therefore are only delaying the inevitable by remaining in a currency union with Germany that ensures their economies are also in a state of slow motion death spiral of economic collapse. In which respect they are in fact making the economic pain of their populations far worse as a consequence of dragging out economic collapse over many years if not decades rather than months as would have been the case had they had their own currencies and money printing presses such as that deployed by the UK that has successfully used smoke and mirrors inflation to mask the truth that Britain is in worse state in terms if indebtedness than most of the euro-zone countries. Greece exiting the Euro-zone would put immediate pressure on all of the other weak Euro-zone members, with Spain and Portugal the next targets for exit as a consequence of these countries being on the same unserviceable debt fuelled economic collapse trajectories as Greece with voters swinging to the far left and right for answers to. 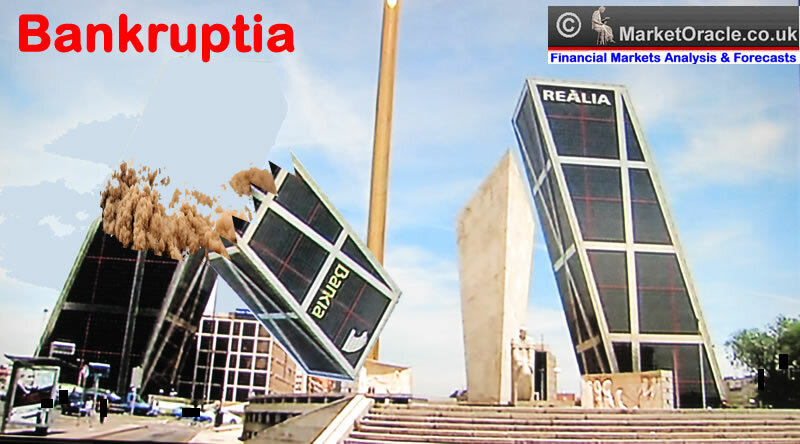 In my opinion Spain and Portugal will both exit the Euro-zone within 12 months of Greece leaving. Though I have to state that courtesy of ECB bond buying there is no sign of contagion yet in the other PIIGS nations as illustrated by low 10 year bond market yields, most of which are trading at well below 2% i.e. Spain 1.5%, apart from Greece's debt which has now nudged above 10%, though even here it is still well below the 2012 crisis highs of over 33% (that it may soon revisit before the end of February!). The wild card in all of this is Germany for as I originally speculated over 4 years ago (May 2010) Germany may decide to alleviate pressure on the rest Eurozone by planning its own exit. However all this would amount to is a desperate belated attempt to buy more time to slow down the rate of collapse of the Euro-zone so as to allow the financial system to better survive a breakup of the whole eurozone. Whilst contagion amongst euro-zone members may be a slow motion affair as countries line up one by one for an orderly exit, however the contagion amongst the banking sector will be immediate and europe wide as credit markets could freeze once more even despite ECB money printing that has the potential to accelerate the collapse of the euro-zone as the potential bailout costs for preventing financial armageddon soar far beyond the means of any of the euro-zone member states to cover. Of course the worlds central banks will do their utmost as they did during 2008 and then again in 2012 to prevent financial armageddon by trying to contain the damage through a myriad of means that they are now well rehearsed in such as bank capitalisation's, providing foreign currency swaps, and in the final instance introduction of capital controls and bank bail-ins cyprus style. The bottom line is that it now looks probable that Greece will leave the Euro-zone within the next 12 months, during which time it will become clearer which other euro-zone members will start to formulate their own exits from the perpetual economic depression of the euro-zone. Especially if after the initial pain (inflation) the Greek economy actually does start to recover strongly which could result in a stampede collapse of the euro-zone. Active market participants tend to ignore much of the media hype that surrounds what is going in Greece and the euro-zone and instead focus on the real news which is that despite German resistance, the announcement that the ECB WILL PRINT MONEY. It does not matter if the amount announced was more or less than expected, for once money printing starts it does not tend to end with QE1, instead the Euro-zone as has been the case for much of the rest of the world can look forwards to QE2,QE3,QE4 which means a lot of asset price inflation that will not just impact on european assets but liquidity will actually flood out into the stronger markets such as the UK and US as a consequence of posing LESS risk to market participants than the euro-zone. Therefore whilst the media was focused on the end of US QE, despite the likelihood the Fed has many such tricks up its sleeves to flood the markets with liquidity. The reality is one of continuous rampant global money printing which ensures that expectations of deflation will always be a delusion, as I wrote 5 years ago in the Inflation Mega-trend ebook (FREE DOWNLOAD). The worlds economies swim in an ocean of inflation that is punctuated by occasional ripples of deflation which is illustrated by the perpetual upward curve of general prices as measured by the Consumer Price Index (CPI). Inflation in the long-run impacts on virtually all commodities and asset prices. Therefore despite increasing market volatility due to uncertainty, however in the long-run Greece / the euro-zone crisis will have little effect on the Dow in terms of the year on year bull market trend. Whilst most ordinary people across the UK are reaping the benefits of the oil price crash to below $50 that has resulted in energy bills being cut by 10% and the price at the petrol pumps nudging to below £1 a litre not seen since 2009. However, there is one part of the UK where its largest industry is in a state of collapse and along with it the regional economy and that is Scotland and its North Sea Oil industry which has been thrown into turmoil. 07 Sep 2014 - Scottish Independence YES Vote Panic - Scotland Committing Suicide and Terminating the UK? My long-standing view is that along as GDP is not collapsing, which given US GDP Expectations of 3% for 2015 is not, then a low / falling oil price should be good for the US and much of the global economy and conversely apart form those sectors reliant on a high oil price then this should boost demand in an economy and thus most stock market sectors should benefit from falling energy costs. The negative impact of falling oil prices is that it could be and actually is a sign of slowing global demand, i.e. its a sign of a weakening global economy, namely the euro-zone and China which will impact on US stocks as revenues and profits from foreign markets fall. Complicating the situation further is that as a consequence of the fracking boom, US oil production during the past 5 years has soared by approaching 50% to around 15m barrels per day which now even exceeds Saudi oil production by at least 2 million barrels per day. Therefore the overall picture is one of substantially increasing supply coupled with a slowing demand that will remain a net strong positive for most US Stocks for 2015, especially those reliant on energy costs such as the airlines and transportation companies, conversely those sectors reliant on high oil prices will suffer such as the oil exploration and drilling and services companies. The stock oil price graph further illustrates an overall inverse relationship between oil and general stock prices, that is along as GDP is growing and not contracting (recession). So despite at least some negative blowback from the a weak euro-zone, slowing China and suffering oil sector. Overall a low oil price should boost the US economy and stock market, so after the market has fully come to terms with the ongoing collapse in oil price then the stock market should resolve to a bullish trend. My in depth US Dollar analysis of Mid December concluded in the following trend forecast for the 2015 to converge towards a peak in the US Dollar by August 2015 to a spike above USD100 before retreating towards 92 by the end of the year. Fundamentally a strong US Dollar tends to be negative for international stocks because it reduces revenues in foreign currency and makes US exports more expensive, conversely it boosts domestic consumer stocks as the costs of imports falls as the same dollar can buy more foreign goods and services i.e. as we have seen with the fall in the crude oil price. The Dow / USD chart clearly illustrates that the a strong or weak US Dollar does not translate into any significant impact on the stock market. Therefore the stock market CAN and HAS continued to rise along WITH a strong US Dollar, as well as not forgetting that a strong dollar means foreigners buying dollar assets such as stocks and housing. From QE1, to QE2 to QE3, the Fed since before this stocks bull market began has been printing money and buying mostly government bonds from their fellow bankster brethren the successful result of which has been to suppress interest rates and generate artificial profits for the banks to continue to bank as bonuses for fictitious performance levels. Where the stock market is concerned is that the flood of some $5 trillion of money printing has in part driven the stocks bull market, much as I voiced would right at the start of this bull market in March 2009. With the apparent end of QE many analysts concluded that it was all over, and that rates were set to rise which spells doom for the stock market, all without realising two fundamental factors. 1. After all that blood, sweat and tears, is the Fed really going to pull the rug out from under the stock market? I don't think so! Be under no delusion, money printing STILL continues through various open market operations. Therefore QE is NOT REALLY OVER. There WILL be QE4! Another point to consider is that its the EFFECT and not the CAUSE that we need to focus on i.e. US bond prices and where bonds stand there is no sign of an end of the US Treasury bond bull market. In fact the END of QE has seen bond prices literally soar! Which reveals the truth of what really is going on! 2. Yes, it is likely that the Fed will start to raise rates during 2015, we can probably expect the first and only rate rise of the year around August. However the facts are that the early years of a rate hiking cycle tend to be BULLISH for stock prices, for the interest rate rises tend to take place in a climate of economic strength NOT weakness. Instead it is interest rate CUTS that bulls usually need to fear for they signal weakness ahead as was the case during 2008 and into mid 2009. Furthermore remember that Fed is just one central bank, yes the most powerful but one, and in this respect what is termed as 'currency wars' best describes the global money printing battle which basically means those nations that do not print money will eventually be forced to print money else see there currency soar against the rampant money printers. We have seen this play out with the European Central Bank which has been forced to start printing money. So another reason why the Fed will print money for if it does not that the US Dollar will continue to soar that will result in falling demand as exports diminish and cheap imports swamp the US market. Therefore contrary to the growing bearish consensus, I see the announcement for the 'end of QE' as a red herring, as I don't think it will have either a bullish or bearish effect on the bull markets primary trend as in my opinion QE has not really ended, just the Fed pressing the pause button for a few months. So, yes whilst this implies greater volatility as the market trend is not being smoothed out as we have witnessed during January's wild gyrations, but NO, the 6 year stocks bull market has not come to an end. a. Total Debt is NOT Deleveraging it is expanding. The bankrupt banks (bankster's) never went bankrupt instead transferred their debts over to the tax payers. b. Governments such as the US can and DO PRINT MONEY! How can there be deflation when the government can just print an infinite amount of money ? There can't! Therefore the whole deflation argument amounts to nothing more than government / central bank propaganda so that they CAN GET AWAY with PRINTING MONEY to BUY votes, to line their pockets, to funnel to their 0.1% masters! Deflation IS a DELUSION ! There will NEVER be persistent deflation! There will never be debt deleveraging. Instead the trend is one of exponential inflation. This is why many market commentators miss whole bull markets whilst banging the drums of always imminent DEFLATION which translates into an always imminent crash or bear market that has FAILED to materialise for SIX YEARS! Therefore all prices, including asset prices such as stocks will continue to be leveraged to and oscillate around an exponential inflation mega-trend. The Dow has fallen towards its 200day moving average as the target for normal deep corrections that usually results in a resumption of the bull market. With the more minor corrections contained by the 100 day moving average. Whilst last October's low did break 200 day moving average,however I don't expect similar for now or the NEXT correction, i.e. for the 200 day to continue to hold which implies that Januarys volatility is about as bad it gets for 2015 i.e. indicative of a volatility trend similar to that of 2014. In terms of price action this suggests that the Dow should be gearing up for a trend to a new all time high by late April, before experiencing its next significant correction during the Summer months, back down towards the 200 day moving average. Where EWT is concerned I like to keep things simple, none of this double zig zag nonsense and its like but a simple 5 or 7 wave impulse advance followed by an ABC correction. My last stocks ebook of March 2013 (near 2 years ago) (FREE DOWNLOAD) concluded in the following Elliott Wave mega-trend wave pattern as a rough guide for how long and far the stocks bull market could continue. To date the Dow is actually ahead of the wave pattern, i.e. the trend implies Dow 16k for Feb 2015, against actual of 17,200. Of course it is still a fantasy pattern because no one can put their money on one tool let alone on one chart! Still when something works, then one has to pay attention to it. Especially when you consider that most Dow long-term charts conclude in an ABCD pattern that always implies the end of the 'bear market rally' as being imminent, that's imminent for 6 years now! The Dow's three upper channels have managed to contain most of the Dow's price action for the past 15 months, where the Dow repeatedly targets highs at the top of the central channel and correction lows at the third channel having only breached during October 2014, which still resolved in a trend back to the second channel. Current price action is toying with a break of Channel 3, which would imply a trend to Channel 4 or about 16,500 that would then put the Dow in a trend pattern between Channel 3 and 4 that implies at least Dow 19k before year end and probably above 19,500 during December. The stocks bull market clearly remains in tact as the Dow continues to put in a series of new highs with higher lows. The last major low is 15,855 and the last high is 18,103. The Dow is trading near the recent low of 17,136, a break below which could trigger a downtrend towards the major low. The current price action implies a trading range for some time of between 18,103 and as low as 15855, though I expect significant support around 16,300. So the Dow could spend the first 6 months of the year going nowhere and IN negative territory for much of this time period. The bottom line is that there is NO sign of a TREND REVERSAL, therefore the stocks bull market remains intact. PRICE TARGETS - Upside price targets are 18,100, 18,500, 19000 and 19,500. Downside are 17,130, 16,000, 15855,and then 15,350. Therefore if 17,130 breaks then the Dow could quickly plunge to below 16,000. Whilst a trend to new all time highs would carry the Dow to over 19,000. MACD - The MACD is continuing to unwind its overbought state since late November. However, it has further to go to reach an oversold state, therefore implies a few more weeks of weakness to prime the market for a run to new highs. The VIX is showing diminishing volatility spikes. Which implies the market is coming to terms with uncertainty, so whilst the mainstream press may be in a panic over Greece, the markets are actually calming down. Whilst this is not indicative of an immediate run to new all time highs, neither does it suggest a significant break lower i.e. more along the lines of the Dow entering a trading range. Yes after a near 6 year bull run the stock market is not exactly cheap with the S&P trading on a PE of 18, 12 is cheap, 18 is a little over valued. But this does not translate into an end of the bull market start of a bear market. For bull markets usually tend to peak at bubble extremes, which given 6 years of trend implies we are still several years away, so in terms of valuations this bull market could run for several more years! A very volatile January with the Dow whipsawing all over the place gives an indication of what to expect for much of 2015 which also makes it difficult to conclude in an intra-year trend forecast, especially for the first half of the year. 1. 17,823 - Will the Dow Close Up for its Seventh Year in a Row? Despite the Dow currently being down 3.5% on the start of the year, nevertheless I do expect the Dow to recover the current and probably deeper subsequent intra-year negative trading to end UP on the year for the SEVENTH YEAR! Which means that the Dow will close above 17,823. 2. How Strong will the Dow close by year end ? This is an ageing mature bull market so it is very unlikely that we are going to see gains the likes of 2009 or 2013. Much of this analysis is converging towards the Dow to be trading at a high of between 19,000 and 19,600 during December 2015, a gain of between 6.6% and 10%. The midway point being 8.3%, 19,300. Therefore I am expecting the Dow to end the year between 19,000 and 19,300. 3. Trend Trajectory for 2015? The trend for the first half of 2015 will probably resolve in a volatile difficult to call trading range i.e. the Dow should peak late April then fall during May, but it could just as well do the exact opposite trend this year. The Dow could easily trade at both extremes i.e. set new all time highs AND new lows for the year. Following a volatile first half trend, the Dow should then converge to a Summer correction low that would set the scene for the Dow to enter into a bull trend to a series of new highs continuing into the end of the year and likely experience a correction along the way from Mid September to Late October, finally peaking during December before turning a little lower into the end of the year. My next analysis will probably take an in-depth look at the probable outcome of the May UK General Election, so ensure you remain subscribed to my always free newsletter for this and ongoing detailed analysis and trend forecasts throughout 2015. Your seventh year stocks bull market analyst.